You’re in good company if you’re planning a move over Labor Day weekend. Labor Day is an especially popular time to move for several reasons. One big one is it’s the beginning of September, a time when kids have to head back to school. Families with school-aged children want time to move into their new home so the children can start the new school year in their new school. And, since home sales surge in the summer, a lot of homebuyers and sellers need to move, you guessed it, right around Labor Day. Because Labor Day represents the back-to-school and back-to-work deadline, other folks may be starting a new job in a new city, or settling into a new college or university program, after a summer of traveling. And of course, many people simply choose a three-day weekend to move because it gives them more time to complete the process without having to take time off work. And, finally, most years, the Labor Day weather is nice and mild, making it a perfect weekend for a leisurely move. Well, sadly, all of this makes moving on Labor Day a pretty big challenge for everyone involved. Anyone planning a Labor Day move should take extra steps to account for this very busy move weekend. If you are planning to move over Labor Day weekend, the best thing you can do is plan ahead. Way ahead. Try to book your movers or rental truck and equipment at least a couple of months if you can. Call early and get a written estimate and signed contract to reserve your spot with the movers. If you wait until a few weeks before a Labor Day move, you may not be able to find a quality mover. And, remember, if movers do take on extra business, they may have to raise prices to be able to pay employees overtime. Shop early and get your movers scheduled first before you make your final plans for moving on Labor Day. If you are moving yourself, remember that moving truck rentals, if you need one, also book up really early. Try to reserve one at least a month, maybe more, in advance. The most affordable trucks go very fast. Often, late bookers end up paying a higher price for a big truck when a small, lower price one would have been enough. Even if you have a truck and move yourself, remember that Labor Day is a federal holiday. Many businesses and services like the cable company and post office may be closed. Make sure you arrange for your service switchovers far in advance to be sure that you won’t be left in the dark at your new place on Labor Day. In truth, probably the best way to save money and hassle on a Labor Day move is not to have one if you can avoid it. By this we mean, see if, by scheduling moving your belongings on, say, Thursday, before the weekend, you can get the affordable reservation you need for a moving company or truck. Movers will not be as rushed and they are more likely to show up on time and not get delayed trying to squeeze in other moves which can happen on busy holiday weekends. That way, too, you can spend Friday and the weekend unpacking and settling in. You might even have time to enjoy a bit of rest on Labor Day. If you can’t get time off and you absolutely have to move on the Labor Day weekend, plan every step of the move far ahead. Make a move checklist and be sure that you are not forgetting important priorities like moving boxes utilities, storage and so on. Call those companies a couple of weeks in advance and be sure to find out if the holiday will interfere with the services you need from them. Remember, if you forget anything, it will be harder to take care of during the holiday weekend. If you are moving yourself, be sure to request any help you need from family and friends early. They may be making plans too, and you want to respect their time. On the other hand, many of them will be off work for the holiday weekend, so they may be more available and glad to help. Just don’t forget to feed them, maybe with a traditional Labor Day barbeque in your new backyard. While you might feel desperate to book a Las Vegas mover, choosing an inexperienced or uninsured company could cause more problems than it solves. 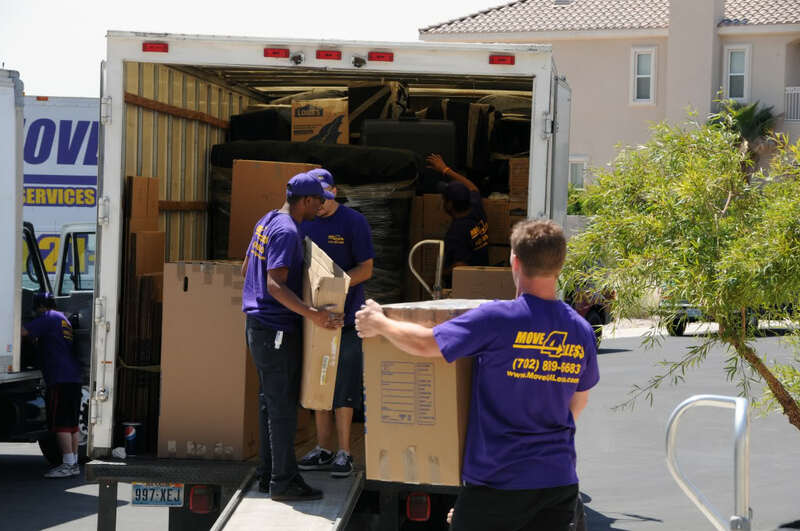 Move 4 Less is a licensed, experienced moving company located in Las Vegas, serving families and businesses with local moves throughout Southern Nevada, as well as long distance and interstate moves. If you’re planning a Labor Day or any other day move, contact Move 4 Less for a free move estimate or call us at 702-889-6683. Let us make your move fast and hassle free and maybe you can kick back and enjoy a little bit of that Labor Day weekend after all. How Do We Rate With Our Customers?